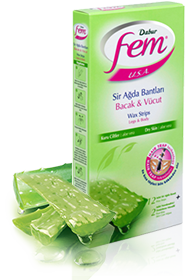 Easy to use: Dabur Fem Wax Strips are not messy and time-consuming as there's no preparation or heating required. Depilation in Seconds that Lasts for Weeks: Removes hair fast and effectively so that you enjoy smooth skin upto 4 weeks. Hair Trap Technology: With new Hair Trap Technology, Dabur Fem Wax Strips effectively removes even the shortest hair giving you silky-smooth skin. 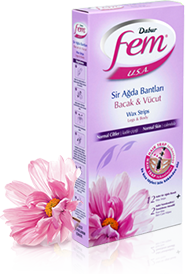 Care for Skin: Post Wax Skin Care Wipes ensure that your skin is softer and moisturized even after depilation. Enriched with Strawberry, rich in anti-oxidants, Vitamin C and salicylic acid,Dabur Fem Wax Strips protects the skin against free radicals attack which cause faster damage and ageing of skin. Strawberry is rich in anti-oxidants which helps keep the skin healthy. It helps the skin get rid of dead cells giving beautiful & shinier looking skin. Enriched with Calendula, rich in flavonoids that helps protect the skin from inflammation and rashes. Dabur Fem Wax Strips with the added benefit of Calendula ensures that your skin remains youthful, soft and hydrated for a long time. Enriched with Aloe Vera,rich in essential amino acids and minerals, Dabur Fem Wax Strips shields your skin against dryness and irritation, plus the added benefit of Aloe Vera which provides burst of moisture ensuring that your skin remains moisturized and nourished after you have removed hair. Dabur Fem Hair Removal Cream with a fast and super-effective formula keeps your skin smoother for Longer by dissolving any hair from deep below without any pain. Enriched with Avocado Oil – a rich source of Vitamin A, B, D & E – it intensively moisturizes giving you long-lastingly smooth and soft skin. Why is the BALANCING LOTION important? Your skin has a normal pH in the range of 4.5-5.5. Post application of Hair Removal Cream, the pH of your skin increases to a range of 7.0-8.5 leading to skin damage, irritation, roughness and dry skin. Dabur Fem Hair Removal Cream with its unique pH Balancing Skin Care Lotion enriched with Jojoba Oil and Aloe Vera restores the pH of your skin to its normal range. So now, with the new Fem Hair Removal System, experience quick hair removal for a silky smooth feel plus velvet soft skin for long.